The Manchester Symphony Orchestra and Chorale will open its 52nd season Saturday, Nov. 19 (rescheduled from Oct. 29), with a concert under the baton of new Music Director Cheung Chau. Chau’s path to the podium began with his father, who was a cellist with the Hong Kong Philharmonic. Chau began playing at the age of 7, and by the age of 12 he had won the first of several prestigious awards and scholarships to study cello. It was only after a hand injury temporarily interrupted his cello career that he took up conducting. He earned the first double doctorate in the history of the New England Conservatory in Boston, in conducting and cello. 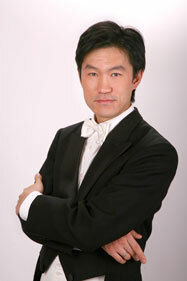 Chau has conducted orchestras in the U.S., Poland, Italy, Germany, Sweden, Russia, and China, and is currently director of orchestra in residence at the University of Connecticut. He is a member of the Atma Trio, an ensemble that includes his wife, violinist Blanka Bednarz. Chau said he has embraced his dual roles as performer and conductor. For the MSOC, finding a replacement for the previous conductor, Lewis J. Buckley, was a challenge. “Lew came to us after 30 years leading the Coast Guard band and he really moved the group forward, so we knew we had big shoes to fill,” said Bradley. More than 30 candidates were evaluated, and Chau soon distinguished himself. “Members of our search committee came back from one of his performances and said, ‘You’ve got to see this guy,'” said Bradley. Violinist Jody Danielson was among the many who voiced support for Chau’s selection. “He has shown great enthusiasm for this opportunity and is an excellent communicator and musician,” said Danielson. The concert also includes selections from Bizet’s opera “Carmen” and the overture to the musical “Candide” by Leonard Bernstein. While the program was chosen before Chau’s arrival, he has easily taken it in stride. musical tradition and tells the of a talented newcomer who succeeds in winning the appreciation of the musicians and, ultimately, the entire town. Saturday’s performance will begin at 7:30 p.m. in the SBM Foundation Auditorium at Manchester Community College. Tickets can be purchased at the door. Admission is $18, $15 for seniors and students, and free for those under 18.